Intimidate: Upon entering battle, the opponent’s Attack lowers one stage. In a Double Battle, both opponents’ Attack are lowered. Pokémon with the Clear Body, Hyper Cutter, or White Smoke ability are unaffected. In a link battle, if both sides switch on the same turn, and first player sends out a Pokémon with Intimidate, the opponent’s Attack will be lowered before the opponent’s Pokémon switches. Quick Feet: Speed is increased by 50% when induced with a status (BURN, SLEEP, POISON, FREEZE but not PARALYZE). Its horns are used to show authority, and it emanates a scent that alerts its pack when in danger. these horns are highly prized, but rarely gotten by poachers. The pokemon needs to kill while holding a Razor Fang. Who it kills doesn't matter. 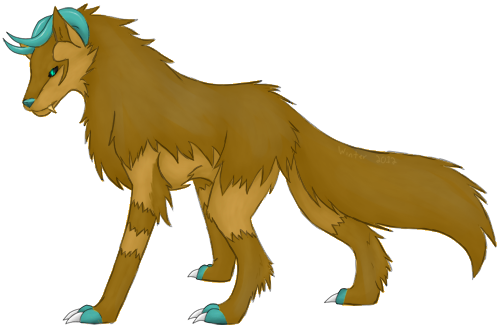 Direyena evolves to become leader of its pack. It now stronger jaws have the power to crush even boulders, and it is often hunted for its precious, but rarely gotten horns. Once evolves, its fur has now completely covered its back and has wrapped itself around its neck. Its top fangs are now visible, growing to long to stay hidden in its mouth. Its Claws are now sharp enough to cut through thick metal. Because of the way it must evolve, its not a very comman pokemon, belonging to only a few trainers, and its trainers are mostly people who care very little about others safety and well being. Its tail has grown longer to help support the weight of its newly grown horns. The horns can be used to mark its packs territory, being very hostile to trespassers, being human or pokemon, and are not afraid to attack if you show any signs that you are a threat. If a horn breaks off, a new one grows back quickly.